On September 19th, Frank Theuns starts with a series of concerts together with Wim Winters (°Lommel, 1972). 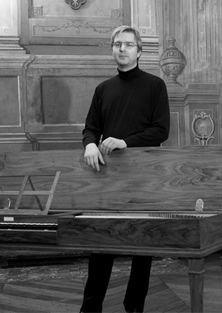 In 1990 Wim Winters was accepted to the Sweelinck conservatory in Amsterdam, where he studied with Jacques van Oortmerssen (organ) and Willem Brons (piano). He also studied with Jean Boyer, Hans van Nieuwkoop, Hans Davidsson and Harald Vogel. Wim Winters is in the first place known as an organist, but eager to explore other keyboards, Wim Winters devotes a substantial part of his interpretative work to the clavichord. Wim Winters plays an instrument (2009) by Joris Potvlieghe. For nearly 25 years, Potvlieghe built clavichords for major musicians and conservatories worldwide, becoming one of the first clavichord builders of today. The instrument is perfectly capable of performing for an audience of 150 people, turning the atmosphere, only by its unique way of sound production, in to a very concentrated and intense happening. Frank Theuns and Wim Winters will perform music by J.S. Bach, C.P.E. Bach and Telemann.